Written by Devyn Kehlenbeck of the Oregon Track Club account team. Ever wonder why one of Track Town USA’s most popular places, Historic Hayward Field, is now a pile of rubble? From its birth in 1919 as the University of Oregon’s football field, to the nine NCAA Championships, three U.S. Olympic Trials, the annual Prefontaine Classic, six National Championships, and home to many iconic athletes, its history is rich and one of the most famous track and field destinations in the world. Despite its deep roots, the field has been demolished and is in the middle of a renovation. Many are asking, what is the point of the field’s demolition and what will the renovation bring? Designed as a “theatre” for track and field, the stadium, projected to be completed in 2020, will contain many new features and expand seating capacity by nearly 20,000. Views will be unobstructed, the track will increase to nine lanes, spectator and athlete intimacy will increase, and acoustics will be amplified making the crowd’s roar even more thrilling. The open and airy design will feature transparent panels exposing the greenery surrounding it. A continuous roof element will help to trap the acoustics of the crowd. A wood roof structure will be implemented to celebrate Oregon’s positive environmental footprint and dedication to being green. 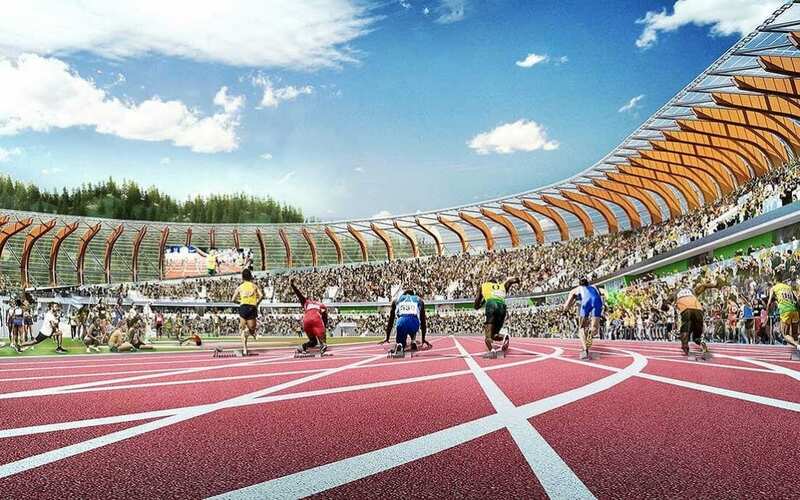 Unlike the original Hayward Field, the new field will offer high-tech athlete amenities. An indoor practice area with six-lane, 140- meter straightway and spaces for long jump, triple jump, throws, and pole vault will be available. There will also be a hydrotherapy room, treatment and rehab area, Alter-G anti-gravity treadmill room and recovery spaces. Individual men and women locker rooms, team locker rooms, a weight room and equipment room will also be added. Must be nice to be a Track and Field athlete! A symbolic Olympic Metal torch will be placed along the east stands of the stadium. Not to be mistaken for décor, this torch will house many stories, each with their own purpose. Viewing areas, an exterior observation deck and a training staircase to the top of the torch are just a few of the perks to each floor. There will also be levels of exhibition rooms that display many iconic Track and Field historical pieces. Additionally, a 4,000-square-foot Hayward Field Museum will be constructed underneath the east stadium. Windows will face Agate Street and displays will showcase biographical information of all UO track coaches. Despite Hayward Field as we once knew it, this renovation will attract more crowds and encourage athletic performance for the University’s Track and Field. From enhancing the viewer experience, to offering the most advanced athlete training facilities, to paying tribute to its iconic Olympic History and predecessor’s before it, Hayward Field is bound to produce history for centuries to come.